Future Effects – The Ultimate Guide to Next-Gen Plug-Ins – MusicTech | MusicTech. NAMM 2014 Gear Highlights: Great quick review from NYC’s SonicScoop. via NAMM 2014 Gear Highlights: 36 Picks to Improve Your Studio : SonicScoop – Creative, Technical & Business Connections For NYC’s Music & Sound Community. 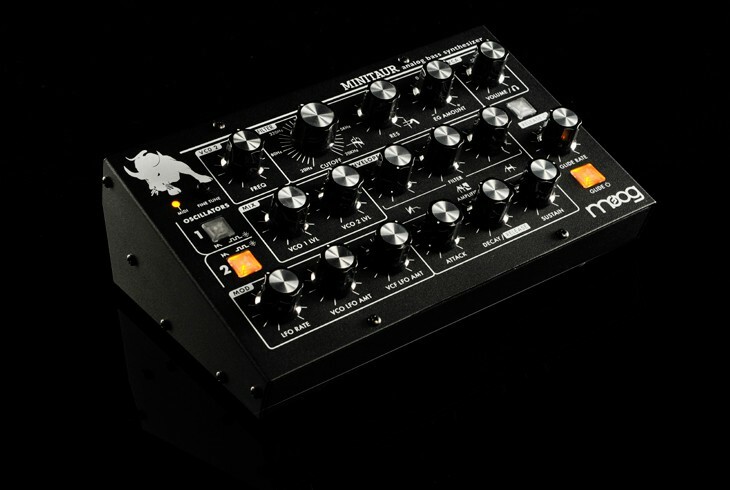 MINITAUR | Moog Music Inc.
Minitaur is a powerful, compact Analog Bass Synthesizer that features a classic one knob per function design. It is the first instrument in the Taurus family that does not have foot pedals. At only 8.5″ x 5.25″ and less than 3lbs, the Minitaur puts legendary analog Moog bass into a package designed to fit seamlessly into today’s performance and production environments. There are no confusing or convoluted menus to dig through. Plug in a MIDI controller or hook it up to your computer and start playing immediately. Don’t be fooled by it’s size. Minitaur delivers all the growl, snarl and low end assosiciated with the Taurus family of Bass Synthesizers in a rugged performance package that is small enough to take with you anywhere. • One knob per function interface for tweaking and creating new sounds on the fly. It also makes live performance a blast. • Two oscillators with Sawtooth (Original Taurus) and Square wave-shapes for each VCO. Recreate sounds of the original Taurus with sawtooth waves, or create new sounds with square waves or a combination of both. • 2 Mixer VCAs for VCO levels control of Oscillators 1 and 2. • Moog Ladder Filter with adjustable resonance delivers classic Taurus 1 and 3 bass and boom. •Two Minimoog style ADSR Envelope Generators for modulating VCF and VCA. The Decay and Release segments are controlled by the Decay knob, while the Release segment is enabled or disabled via Release On/Off switch. • DIN MIDI and MIDI over USB offer complete control of the Minitaur’s sound engine. • Analog Control inputs for Pitch, Filter, Volume and Gate. Use an EP2 or CV to connect and control MInitaur with everything from Modulars to Moogerfoogers. • External audio input for processing external audio through the Mixer and Filter section of Minitaur. • Headphone output with 1/8″ connection. • Compact rugged steel chassis that is built like a tank.